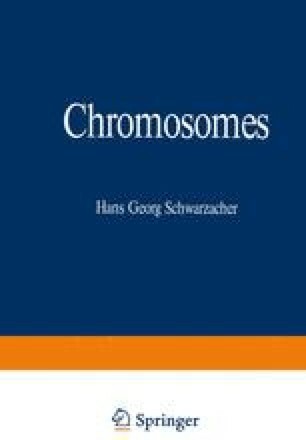 In the foregoing chapter, the main emphasis was placed on the structure of chromosomes in mitosis. Chromosomes contract with the onset of mitosis forming microscopically visible single thread- or rodlike structures. After mitosis is completed, the daughter nuclei are restored involving a disappearance of the chromosomes as individual microscopic bodies. During the interphase the mass of chromosomes forms the so-called “chromatin”. Since the chromosomes reappear in each mitosis in exactly the same shape and number (even chromosome rearrangements, breaks and other abnormalities are carried through interphase from mitosis to mitosis), it seems to be quite clear that they keep their individuality during interphase. It seems to be also apparent that they are extended into rather thin and long threads in interphase. The best direct evidence for the persistence of the chromosomes comes from observations on polytene chromosomes (as e.g. in the giant cells of salivary glands of Drosophila) during interphase (Heitz and Bauer, 1933; see e.g. Beermann, 1972; Hennig, 1974).